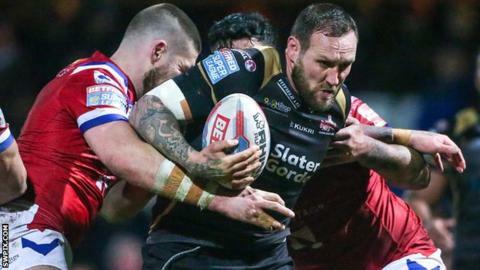 Ex-England forward Gareth Hock has left Leigh Centurions to pursue his aim of finishing his career in Super League. Hock, 34, had a contract with Leigh for 2018 but had the option to leave after their relegation to the Championship. He joined Leigh in February 2015 after leaving Salford and scored 12 tries in 53 games for the club. "Gaz deserves to end his time playing in Super League after the career he has had. I wish him well in that campaign," said Leigh owner Derek Beaumont. "He has achieved so much in the game and I am grateful for his efforts, joining us in the Championship, sticking with it and eventually seeing us make it into Super League." Hock, who spent 10 years as a player with Wigan earlier in his career and also played for Great Britain, made 13 appearances this season before his campaign was ended by injury. "I have really enjoyed my time at Leigh. In fact I have loved every minute," he added. Leigh were relegated after one season back in Super League following their defeat by Catalans Dragons in the Million Pound Game.